short girl, long island. 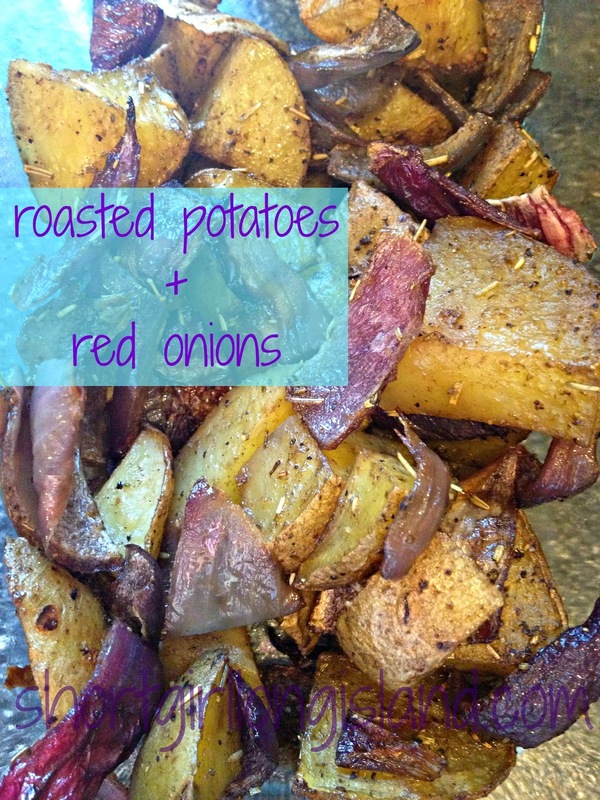 : Roasted Potatoes + Red Onions = Two Variations. Last summer, I was on a roasted veggies kick. The other day I was talking to my friend, Tori, about blogging recipes. She mentioned how the roasted veggies I made always looked good, so I decided to make something simple - roasted potatoes + red onions. When I say simple, I really mean it. The most difficult task you're going to encounter is waiting until the potatoes cool down so you don't burn the roof of your mouth. I tested out two recipes. Feel free to follow them or branch out + change up the spices. Line your baking dish with aluminum foil [super easy cleanup + helps transport from tray to serving dish]. Place potatoes + onion slices in baking dish, then add olive oil. As evenly as possible, sprinkle the spices on top. With clean hands, mix//coat the potatoes + onions in oil//spices. Trust me, this is the way to go - just like I said last week, referring to grandma's meatball mixing technique - your hands are one of the greatest tools in the kitchen. When you're done, wash your hands, ya filthy animal. Put potatoes into the oven + set the timer for 30 minutes. Stir [with a spoon, not your hands] after 15 minutes. Shut the oven off. Remove potatoes, stir, then place the dish back into the oven for another 15 minutes [yes, while the oven is off - you read that correctly]. Remove from the oven + serve. I am a lazy human when it comes to scrubbing dishes, so the aluminum foil is my BFF. Plus, If I'm transporting into a bowl, all I do is wait for the aluminum foil to cool, pick up the corners + dump into the bowl. Out of the two recipes concocted, the cinnamon ginger is my favorite. Next batch, I'm going to double the onions, because they're the first to disappear from the dish.